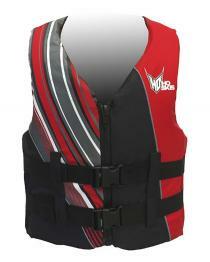 HO Sports Infinite Mens Nylon Life Vest, RED, USCGA approved in all sizes. 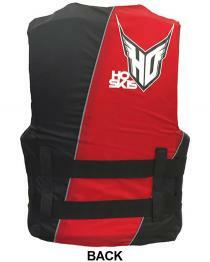 HO Sports improved this nylon life jacket by using softer foam and more panels for better movement. Has font and back foam panels with independent side panels on both sides and Center zipper with 2 quick release buckles. The large arm holes will not ride up and rub your arm pits when do activities in the water which cheaper nylon life vests with small arm holes have that problem. This vest is the 2017 color pattern and we only have a few size LG in stock. Please click on related products tab to see the 2019 RED. 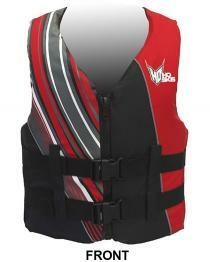 The 2019 is the same vest in the 2019 color pattern, and all sizes are in stock. Note on size: Measure your chest circumference under the arms and across the pecs. Also measure the belly. If your belly measurement is bigger than your chest measurement, the chart based on chest size will not work and will be too small for you. In that case, it is better to buy a size larger than what is indicated by your measured chest size. Water Ski World is does not guarantee a fit based on the manufactures size charts because everybody has a different body shapes. Size charts are set for a snug athletic fit. If using for fishing or relaxation, perhaps a size larger will provide better comfort.